I don't know about your family, but the one I belong to is not all that fond of going around the table on Thanksgiving and saying out loud what we are grateful for. We will do it if we "have to", but much of my family is not comfortable with that. In that situation, what is a memory-keeping, lay-it-all-on-the-line girl like me supposed to do? An idea started to form: what if we had a box, and everyone wrote down (in secret) what they were grateful for and we put it in the box? Then everyone is happy right? Crafty me got to work. First, a run to various craft stores looking for the "right" box. I decided I wanted a cigar-style plain wooden box. Next step was digging through my scrapbook kits for the perfect fall paper and embellishments to pretty it up. And of course - Mod Podge to make the whole idea work. I measured and cut paper for all the surfaces I wanted to cover. I slathered on modge podge and attached my papers. I wanted a "stained" look, so I used a craft sponge and dabbed walnut stain on the bare parts of the box and the edges of the paper. Once you're finished, add another layer of modge podge to seal it. If you want, add ribbons, tags, paper flowers, etc to embellish your box. 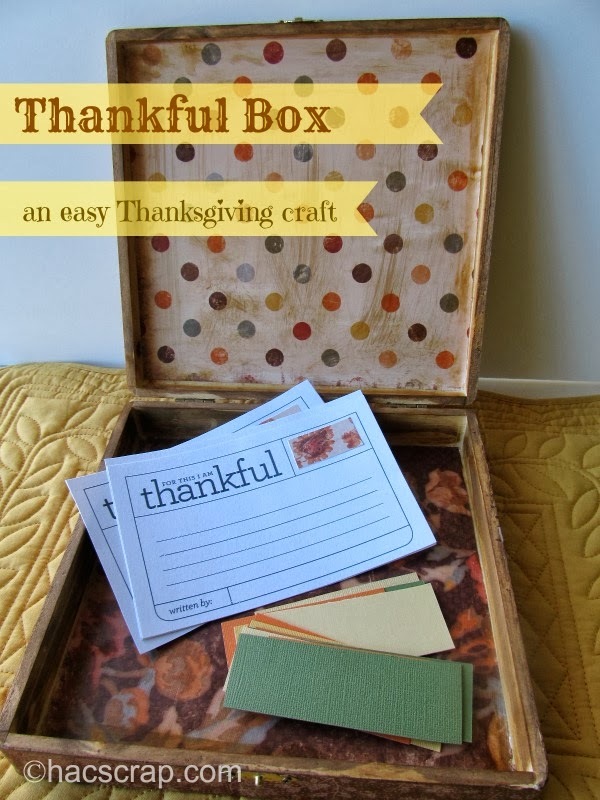 You can use scraps of colored cardstock, or print out cards to hand out around your Thanksgiving table. Remember to throw in some pens or markers too. How do you and your family express gratitude at this time of the year? I really love this idea! I made the rolls with a message in them you've seen on Pinterest two years ago, and we had fun with that, but I put in more Thanksgiving trivia questions/statements and just a few 'share your favorite Thanksgiving memory/dish/etc. type of questions. I think I will try your idea this year and have my kids make the handprint turkeys (also seen on Pinterest) as the top of our box. I think I will cherish it!